Monday night's 11-4 victory by Houston assured the team of one thing - they'd still lead the A.L. West when Oakland left town. The thumping put the A's 2-1/2 games back in the Astros' rear view mirror with just two games left between them in the season series. Hard to believe the schedule-makers intended for the Astros' only division opponents for the final month would be Seattle and Anaheim. Monday night was the first game in two months that George Springer, Jose Altuve and Carlos Correa all were in the starting lineup together and the air of confidence was electrifying. These were the guys who spent last season bludgeoning opponents into submission and Oakland got a full taste of it as a reminder. Gerrit Cole gave up a two-run homer to Marcus Simien in the second and a two-run homer to Matt Chapman in the third for a 4-0 advantage. Then the tide turned. 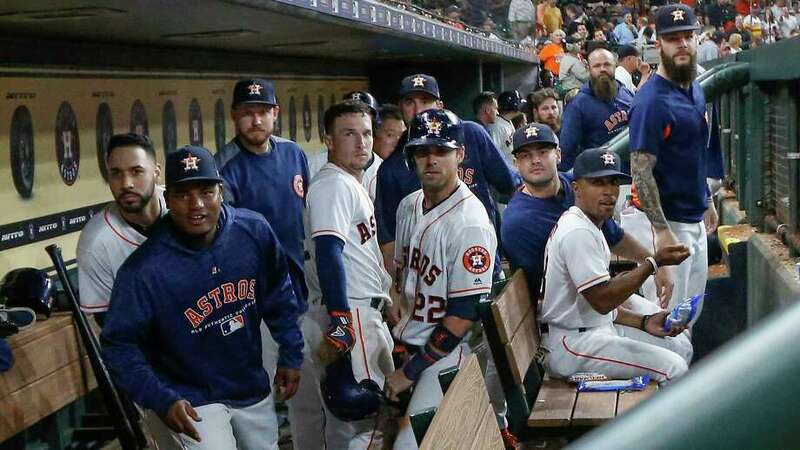 A one-out base hit by Martin Maldonado preceded consecutive doubles by Springer, Alex Bregman and Altuve to get within 4-3 then two-out singles by Marwin Gonzalez and Tyler White gave Houston a 5-4 lead. Cole and the bullpen nursed that one-run edge all the way to the bottom of the eighth when Bregman and White both delivered three-run homers to put this game on ice. Every Astro in the lineup had at least one of the 16 Houston hits. Bregman led the parade with four hits and four RBIs while White also drove in four. Gonzalez added three hits to push his average up to .254 with a red-hot August. Collin McHugh and Ryan Pressly finished up after Cole before Joe Smith secured the final three outs in a non-save situation. A full house of 43,171 added a post-season atmosphere to the Monday night show. The Astros will try for their seventh straight win on Tuesday when Charlie Morton (13-3) has a rematch with veteran Edwin Jackson (4-3) in a 7:10 pm Central battle. Morton had a no-decision on August 17th in Oakland with five shutout innings. Jackson did the same in a game eventually decided by an overturned replay and a walk-off homer. Houston's 81st win also assures they will not suffer a losing season as if anyone had a doubt.